The small village of Ivriz is located eight miles south of Eregli, a provincial town between Karaman and Nigde. The village offers nice views of the Tauros Range which divides the Anatolian plateau from Cilicia and which has peaks of more than 10,000 ft. 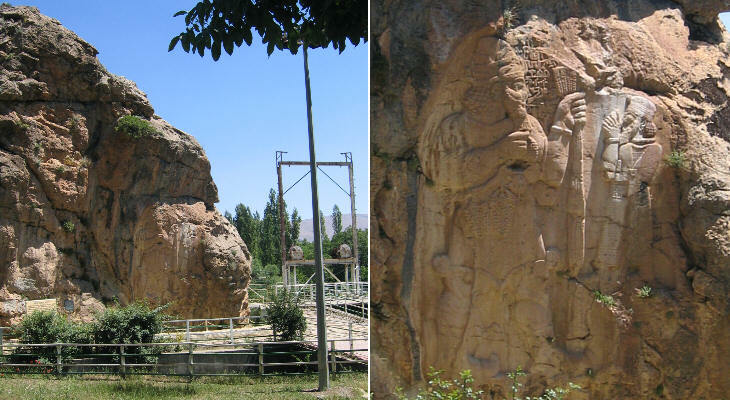 In 1748 Jean Otter, a French academic, reported in his Voyage en Turquie et en Perse that he had seen an ancient (Hittite) relief on a rock near Ivriz. He may have just been told about it because he did not describe it in detail. A sketch of the relief was first published in 1858 in Germany. The relief is carved in a wall of a rock, at the foot of which several ground sources form a sizeable stream which heads north towards Eregli. It is probably this source which is celebrated in the relief. The high mountains which surround the Anatolian plateau stop the clouds on the coastal strips; particularly those areas on the Black Sea, have abundant rainfall. Inland, water is a scarce resource and a stream is a God's blessing. The relief portrays a large figure receiving the homage of a smaller one. They are not a conqueror and his defeated enemy, but a benevolent deity and a powerful king. The deity wears a horned crown and holds a sheaf of wheat and a bunch of grapes which he is about to give to the king who is portrayed in a very Christian adoration gesture. Archaeologists date the relief to the VIIIth century BC and by interpreting the hieroglyphs have given a name to the deity (God Tarun) and to the king (Warpalas, King of Tuwanuva). The relief is very elaborate and it shows a high degree of skill. This could be acquired only through the carving of many reliefs; although some other poorly done reliefs have been found near the village, this one is unique in a vast part of the tableland. 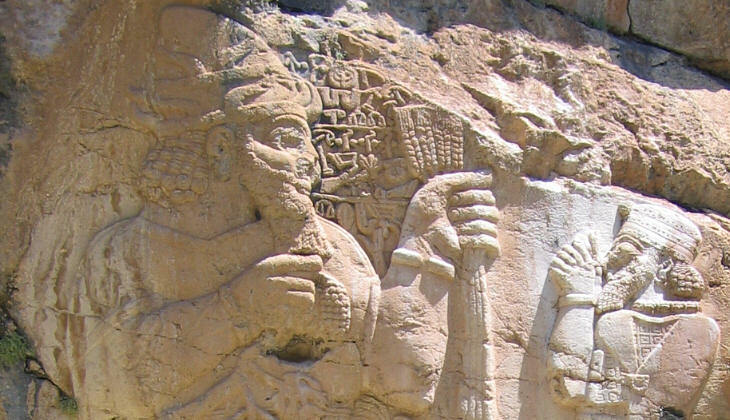 It is likely that other reliefs were destroyed by the Byzantines during their campaigns to eradicate the ancient gods or by the Arabs during their raids. This relief was spared: it would have been a bad omen to destroy a scene portraying fruit and crops being bestowed on mankind. Kemerhisar is a village ten miles south of Nigde. Its name means "castle of the aqueduct", but in antiquity it was a sizeable town known as Tuwanuva (Hittite period) and Tyana (Roman period). 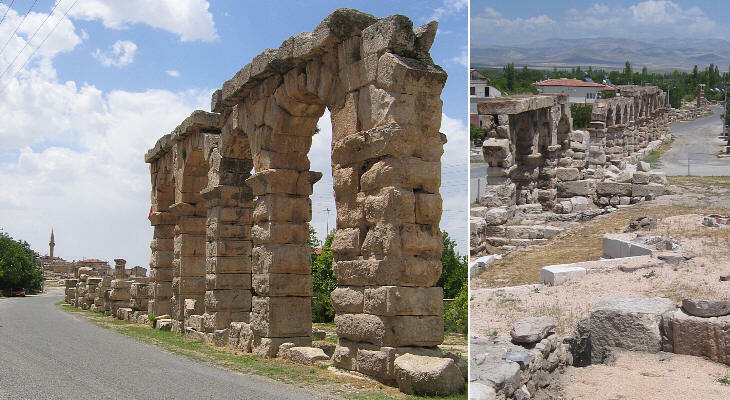 According to archaeologists the aqueduct was built by Emperor Caracalla (211-17 AD). It started some four miles to the east of Tyana. Spring waters were collected in a rectangular basin which was decorated with finely moulded white stones. Water started its journey towards Tyana in an underground conduit. The conduit came to the surface a couple of miles from its final destination. At first one sees just a long line of buried arches, then they very gradually rise up from the ground. Water needed to reach the upper part of Tyana in order to be distributed to the population through fountains. Because the aqueduct is rather short one can easily understand its hydraulic functioning and appreciate the engineering knowledge achieved by the Romans and in particular the preciseness of their measurements. The side of Kemerhisar where the aqueduct reached Tyana is being excavated (summer 2008) and public baths and an early Christian baptistery have been identified. The town of Bor can be considered the heir of Tyana which is just a few miles away. 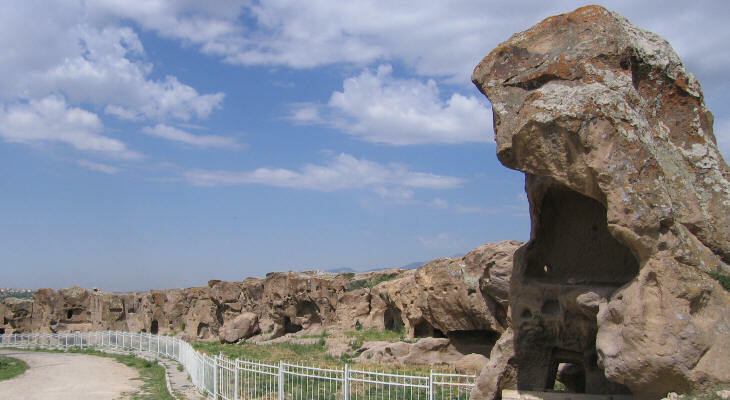 Bor is located along the ancient road leading to Nigde. Today Bor has a very modern aspect yet the presence of some old hammams indicates its inhabitants are still attached to the traditional Ottoman way of life. 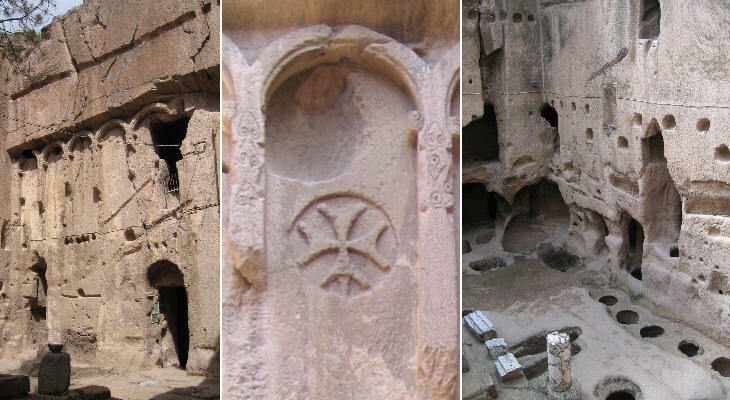 The presence in Bor of a relatively large building which once was a church brings to memory the so called Cappadocian Greeks. While the Greek-speaking people of western Anatolia maintained close contacts with other Greek-speaking groups (either those living in today's Greece or in Constantinople and Smyrna) those living in Cappadocia were isolated. Over time their language absorbed Turkish expressions. At the same time it retained words and syntax structures of Ancient Greek which were abandoned by mainstream Greek communities. 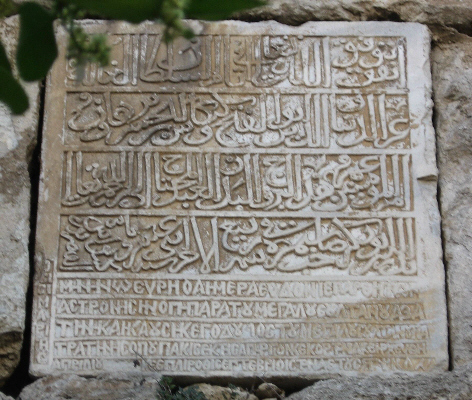 Even the aesthetic aspect of the inscription shown above seems to have been influenced by Muslim art because it is a relief rather than being carved (see a similar (bilingual) inscription - opens in another window/wikipedia image at Sinop). 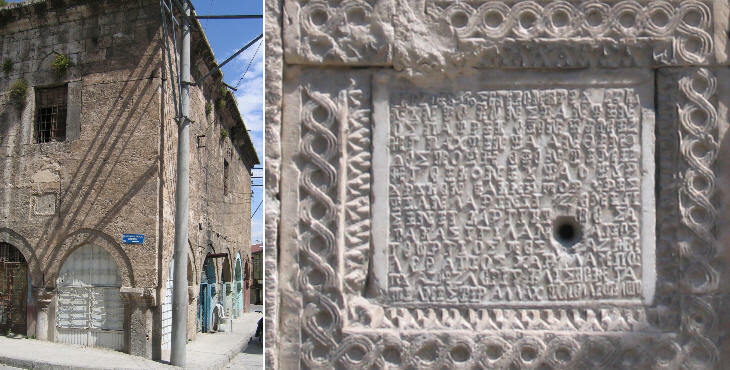 Gumus is a small modern village not far from the ancient road which linked Tyana to Cesarea (today's Kayseri). Eski (old) Gumus is the previous location of the village. The best way to approach Eski Gumus is .. from above. A flat rock with a view over the oasis of Nigde does not show any hint of the presence of the old village until one unexpectedly arrives on the edge of a large square hole cut out of the rock. The inhabitants of Gumus were monks and their servants; cells, warehouses, stables were all cut into the rock. The walls of the courtyard were decorated with blind arches and crosses. The monks gathered in a domed church decorated with frescoes. From the paintings and other decorative elements it is thought the monastery was in existence from the VIIth to the XIth century, a period during which the security in the region was at very low levels. The rock is thought to have been cut to shelter human beings and animals since prehistoric times and people continued to live there until not so long ago. There are more than a hundred "houses" lined up on the eastern side of the rock.